Unfortunately my force was almost entirely hemmed into the corner of the table by an inconveniently placed river, and while my tanks were all able to stay in cover, fires from large Soviet guns took their toll. I could have withstood these losses, as I was starting to whittle down one of the tank companies that I was facing. The real catastrophe was when my mobile reserve of 5 Panzer IVh tanks took 4 longrange shots from several T34’s 76mm cannons, destroying 3 tanks, and causing the other two to flee the field! In addition to being a hit to my morale, it robbed me of the unit I needed to capitalize on gains that my shooting had accomplished. 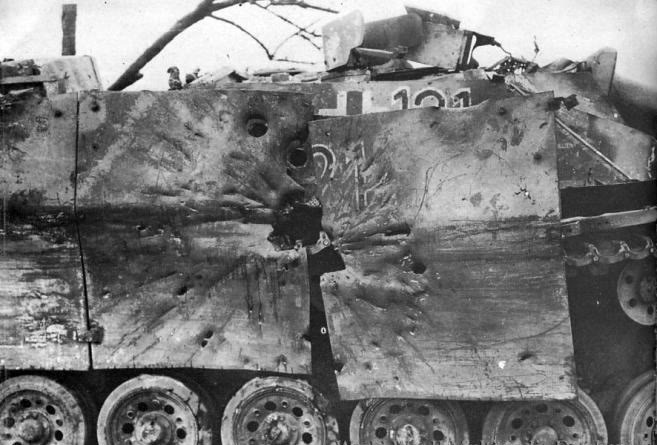 * Other long range fire, and a raid from allied fighter-bombers started to really take their toll against my line of StuGs. Despite this mess, my recon detachment was able to advance quickly, take and hold an objective for practically the entire game! They were my MVPs by far. Sadly my artillery battery didn’t affect the game until late, but was able to slow down the Soviet advance. My line folded when a second company of t34s appeared on my flank, and finished off what was remaining of my StuGs. In the end the Germans held their ground and scored more points by holding, or denying objectives. This was a very pyrrhic victory as there were tank carcasses everywhere, and one more turn would have delivered a substantial allied victory. Thank you to my teammates Jason, and Scott and to my opponents Pete, Brian, and Kevin. Extra thanks to Lexx for help setting up the table at his fantastic shop, Chicagoland Games! *I feel like a weenie when I blame the dice but this was very much a magic moment… for the Soviets. 4 rolls to hit, all come up 6s. My saving throws were 7+1d6, needing to beat 9AT. 1, 1, 1, 2. Then the Kevin passes 4 firepower checks at 3+ Guh. 3 dead tanks, 1 bailed, 1 alive. Morale check roll: 2. The platoon’s surviving members flee the field. Super.